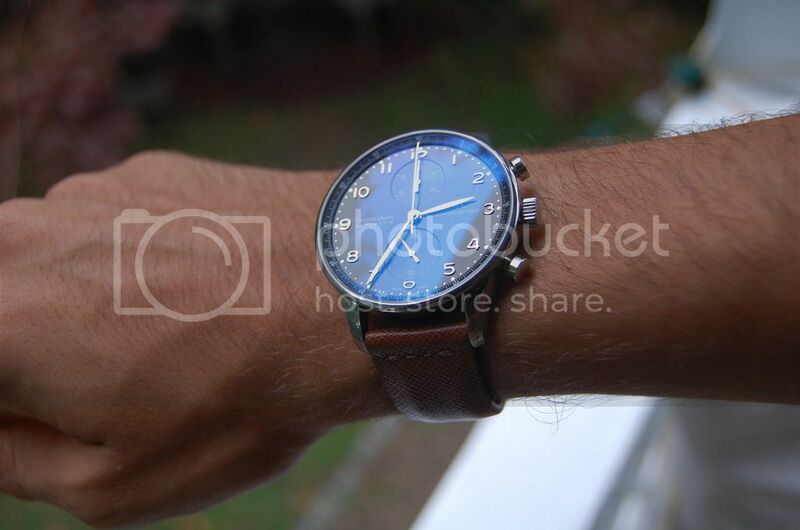 TimeZone : IWC » New IWC! Okay, not new. But new to me! Okay, not really new to me. But sort of. Once upon a time, not so many moons ago, I wore and loved an IWC Portuguese Chrono, 3714, steel, with white dial, gold hands and numerals. And then, fickle, changeable lover that I am, I grew tired of her (I mean it). Lovely as she (I meant it) was, that expansive white dial just started looking more and more expansive, less and less like a (I know better now than to say "the") right watch for me. I'll admit, a white dial white gold Vacheron had something to do with this. Anyway, I went and sold the Portuguese and went and bought a Nomos Zurich and went and sold the Nomos and went and bought... a black dial 3714. So what happened? One thing was the case--I kept thinking of what a perfectly-shaped-and-made case the 3714 has, with its sloping and narrowing polished-top lugs, its perfectly horizontally-brushed mid case sides, and contrasting, equally perfectly vertically-brushed interluggal area (that's the technical term). And I kept thinking of how a black dial would wear smaller than a white dial. What I didn't think of was the possibility that the black dial and silver hands and numerals might be MORE BEAUTIFUL than the white. But it is! The numerals especially play this amazing disappearing-reappearing act, where when the light goes off them, they look small and matte and almost like rose gold against the black dial, but when the light goes on them, they shimmer like... very shimmery things. 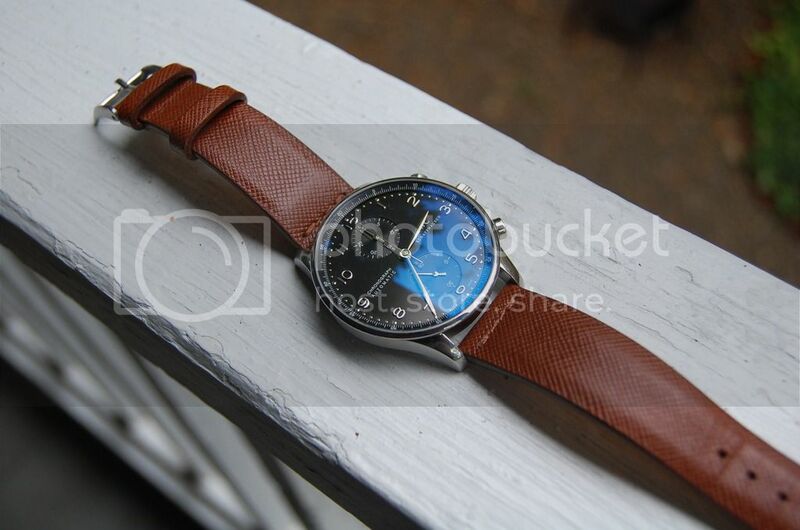 I often said of the white dial 3714 that it belonged on a brown strap, not the black that comes OEM. 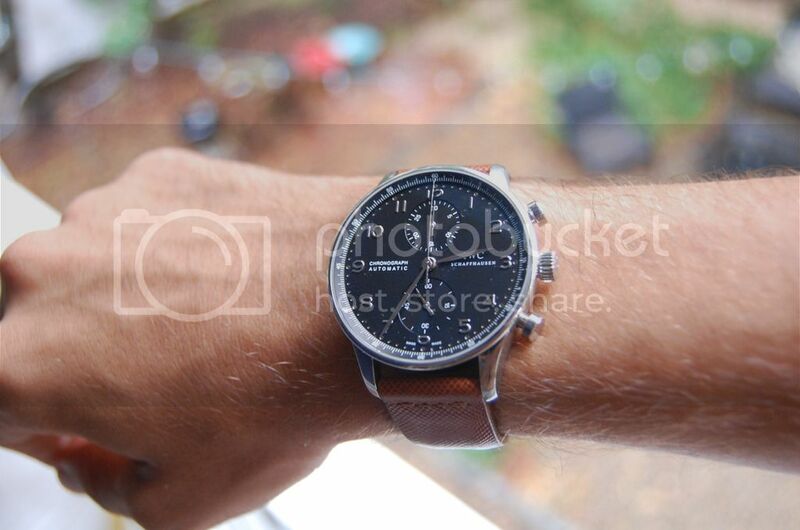 And I tell you now of the black dial 3714: it belongs on a brown strap, not the black that comes OEM! 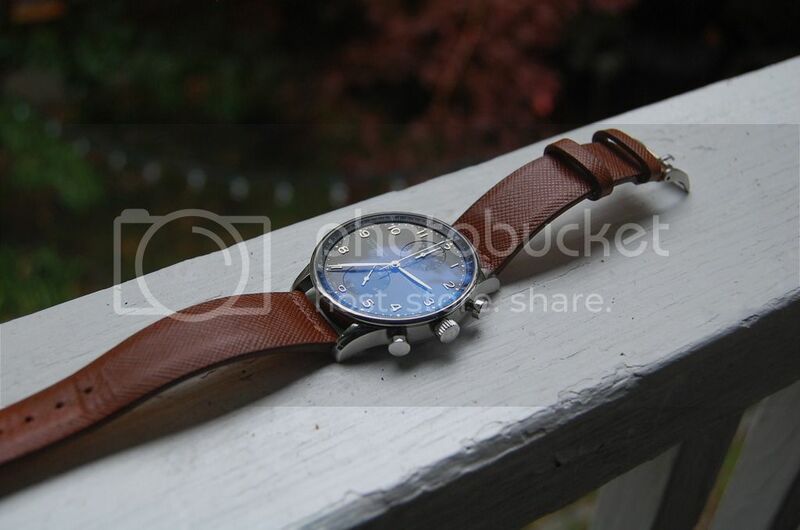 Anyway, I'm very glad to have this new and different watch again.